Slide on a custom leather koozie to keep a pint of beer cool and hands drip-free in the best looking (and well-made) way possible. Recycled leather from boot and lace industries is hand-sewn and branded with a custom design that will never rub off or fade. 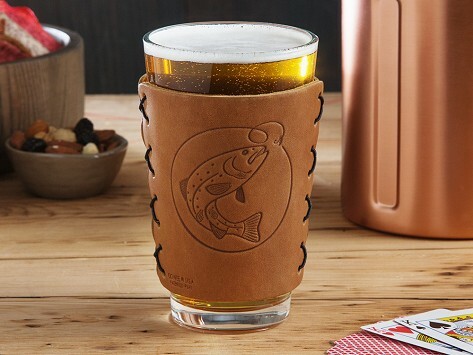 This sophisticated drink sleeve is made in North Carolina and guaranteed for a lifetime. Pint glass is also included. Dimensions: 5.5" x 4.25" x 0.25"
I gave this as a gift and the recipients were very pleased. Excellent craftsmanship and easy ordering and delivery! Thank you for excellent service! Quality made and great fit. I thought it was just the leather sleeve and was very pleased to find you get the pint glass as well.